Growing up in the mid-80s, KISS was always my “favorite” band. I remember how excited I was to see the four original band members in make-up playing live back in 1996 — it was like a dream come true. When I heard that KISS were packing it in during the early 2000s by doing a farewell tour, I attended two of their shows rather than one. Since that time, I have seen KISS play live countless other times, mostly because Paul Stanley and Gene Simmons find a way to keep the KISS juggernaut chugging along twelve years or so after supposedly doing their farewell tour. The excitement and anticipation to go see KISS play live is definitely not as high as it used to be for me in years past, after all, this is my fourth KISS show in five years and third straight at the same venue. However, it seems that every time I end up going to a KISS show — which is every time that the band comes to Toronto — I am pleasantly surprised how good they remain to be. 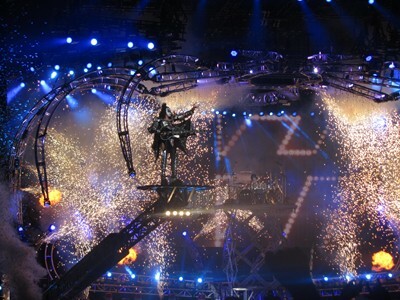 This is despite the fact that most songs at a KISS show do not seem to change much from tour to tour — the one notable exception being during the ‘Alive 35 Tour’ — and the stage “tricks”, albeit spectacular ones from Simmons blowing fire and getting lifted from the stage all the way into the rafters to Stanley flying over part of the audience onto a small platform in the middle of the fans — haven’t changed much in the last twelve years. This time around, and given that I had just seen KISS a little more than 10 months ago, I was actually about to skip their show. However, an unexpected and timely invitation to join my friend Chris in a corporate box free of charge simply could not be passed up! The corporate box experience was a real treat — thank you very much American Express! The opening band Shinedown was already playing by the time I arrived at the concert venue but it appeared from the long set that I listened to that I only missed a few songs. 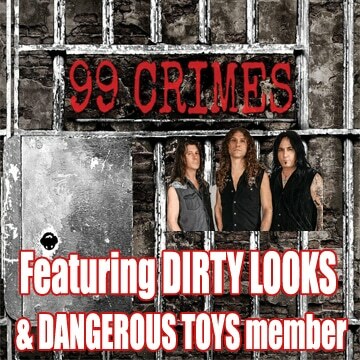 Four guys in shirts and ties… Where do headlining bands find these opening bands? I had never heard any of Shinedown‘s songs before, although I heard that they were “big” in the States. The Shinedown look and experience reminded me of when Canadian band Before The Curtain opened for the Scorpions last summer in Toronto. Both opening acts sported roughly the same look of shirts and ties — and their musical styles were different and more “alternative” than the headliners. 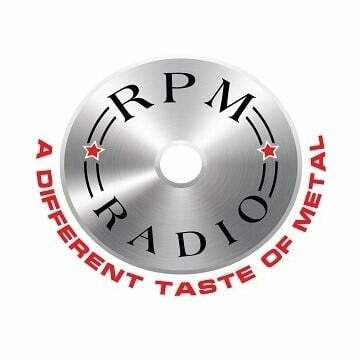 It would have been nice if KISS would have picked an opening band that was more in the metal genre. Nevertheless, I will give credit where credit is due, and Shinedown seemed to have pretty good songs and seemed to engage the audience pretty well. 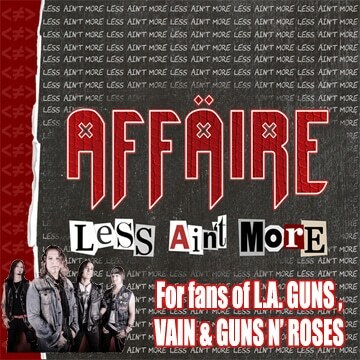 The ultimate test for an opening band, with respect to the part of the audience that has never heard of them, is to make a strong enough impression that the potential new fans want to find out more about the band. From that standpoint, Shinedown failed — at least with me — since after their set I felt no inkling to look into the band and find out more about their music. I was glad when Shinedown finally ended their set — one step closer to seeing the iconic KISS one more time! 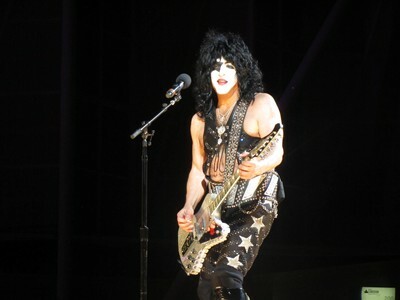 While the KISS stage was getting set up, there was one “celebrity” sighting close to the American Express corporate box. Gene Simmons‘ wife Shannon Tweed and their daughter Sophie were apparently going to view the KISS set from where the soundboards were located. Tweed was a good sport, posing for photos with whichever fans were close enough to where she was hanging out. I would have never thought that I would get a KISS guitar or bass pick from this show, since the corporate boxes were quite far from the stage, but at one point Tweed threw what appeared to be two handfuls of KISS/Simmons bass picks. I did not catch one, but another Chris in my box apparently caught a few of them and was nice enough to give me one — thanks Chris! Eventually, the familiar intro of ‘You wanted the best — you got the best — the hottest band in the world — KISS’ was heard and a huge black backdrop with a big KISS logo suddenly dropped to the floor. 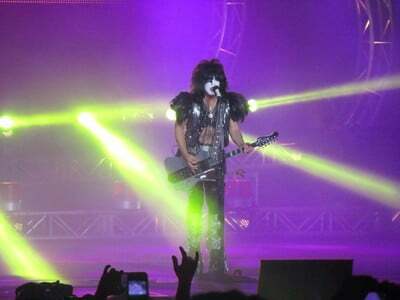 The audience was treated to KISS‘ latest creation, a huge “spider” full of lights descending from the rafters with Simmons, Stanley and guitarist Tommy Thayer on top of it. The band opened with “Psycho Circus” — one of the group’s most underrated songs in my book — had they written and recorded that song back in their ’70s heyday it would surely be a constant staple of their live show today. KISS pulled out all the stops in terms of delivering an over-the-top spectacle that no other band can deliver. 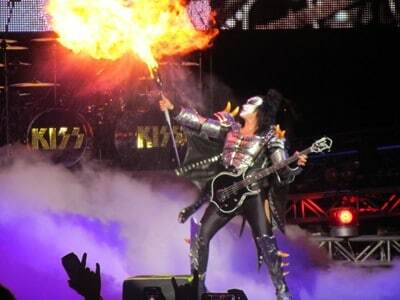 There were more pyros, explosions, risers and lights than I had ever seen at any concert — including any prior KISS show. 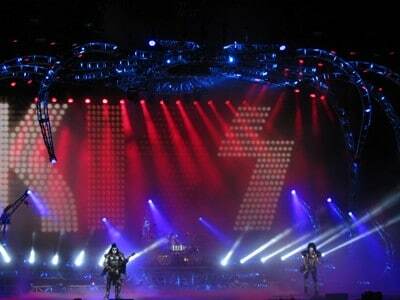 Visually, KISS provided the most bombastic and exciting show that I had ever seen. The band deserves a lot of credit for investing in their shows and certainly giving their fans more than their money’s worth when it comes to visual stimulation at a concert. Sonically, the band sounded great and the songs were well played. But something was missing for me on this night. 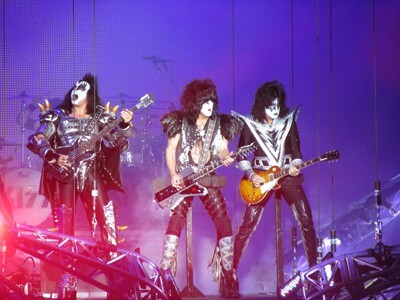 KISS‘ song selection was eerily similar to some of their most recent shows in Toronto. A quick check of past KISS set lists confirmed my suspicions. 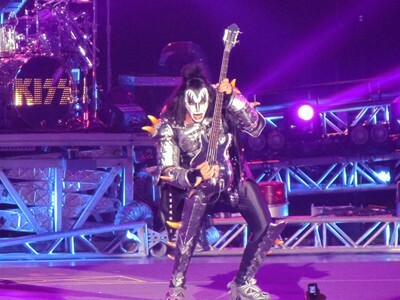 Twelve of the thirteen songs played at KISS‘ previous stop in Toronto in September 2012 were played on this night. 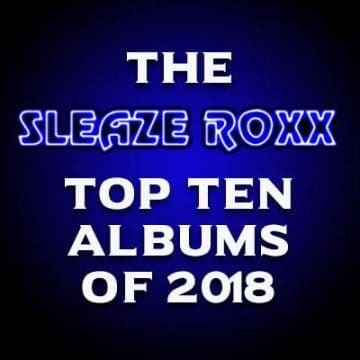 This included the usual staples including “Shout It Out Loud”, “I Love It Loud”, “Calling Dr. Love”, “Lick It Up”, “God Of Thunder”, “Shock Me”, “Love Gun”, “Black Diamond”, “Detroit Rock City” and of course “Rock And Roll All Nite” (complete with confetti galore). The set list was essentially a repeat performance from 10 months ago with some additional songs. Even the set list from KISS‘ show here in September of 2010 was again similar to the one performed this night, with twelve out of 21 songs played in 2010 finding their way into this set. 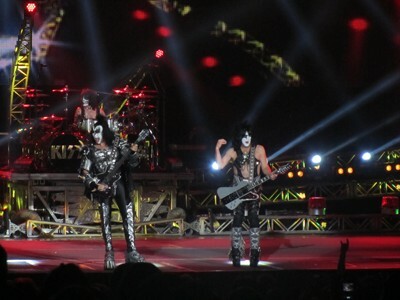 Even though this KISS tour is dubbed the ‘Monster Tour’, only one and a half songs — “Hell Or Hallelujah” and part of “Outta This World” — were played from the new ‘Monster’ CD. I get that bands that have been around as long as KISS have countless songs that fans expect them to play. I also get most casual KISS fans simply want to hear the hits like “I Was Made For Loving You” and “Rock And Roll All Nite”. But what about the long-time KISS fan who is sick and tired of hearing the same songs? I think that KISS should take a page out of Iron Maiden‘s playbook and vary their set list a lot more from tour to tour, especially when it comes back to the same city for four out of five years. How about “Fits Like A Glove” rather than “Lick It Up”? And how about “Makin’ Love” rather than “Calling Dr. Love”? Song highlights for me were “War Machine”, “I Love It Loud” — yes, ‘Creatures Of The Night’ is one of my favorite KISS albums — “Love Gun” and “Black Diamond”. Even though the set list was somewhat disappointing and predictable, the visual excitement of the KISS show made up for it. I give KISS an A+ for visuals and a B for their choice of songs and Paul Stanley‘s sometimes silly intros. At the end of the night, I still felt like I had seen a great show and would most likely go see KISS again — even if the band continues to play, for the most part, the same songs over and over again.